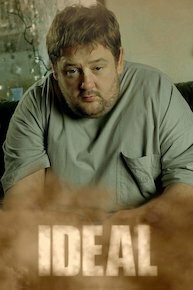 British comedy Ideal stars Johnny Vegas as Moz, a small time cannabis dealer who often claims to be providing a service to his local community in Manchester, England. During each episode Moz remains in place on his sofa, rarely, if ever, leaving his small apartment. Around him, Moz finds different people who wish to buy cannabis from him, a series of returning characters and guest stars attend the apartment occupied by Moz on a regular basis. Moz spends a large amount of his time dealing with the problems caused by his clients and main supplier, policeman Phil Collins. Moz and Jenny's cosy love situation is thrown into chaos when Psycho Paul's gang hole up in the flat. It's all change for Moz as Nicki moves out and new love Jenny moves in. Nicki's birthday party doesn't go entirely according to plan, while Moz splits up with Jenny. Despite Moz and Jenny's best efforts to keep their affair secret it seems like everybody knows what's going on. Everybody except Nicki, who's too busy having her own illicit affair with PC. Jenny is drunk and decides to visit Moz. Meanwhile, Lee is trapped inside the broken boiler and it's getting hauled away. Moz reminisces about the past. Moz has a suspected heart attack. It's Moz's birthday, and all Nicki has bought him is a sandwich and some chocolate, so she decides to throw him a party in the flat. A face from Nicki's past arrives unexpectedly wanting to stay, the polaroids from behind the bathroom cabinet go missing and re-appear, and Moz is selling red weed. Moz gets rid of his stalker and China has split up with her boyfriend. Meanwhile Colin tries to flog some stolen goods (even though he's still on probation) and then steals the photos of Nicki. Colin (who's still on probation) tells Moz about the body found across the road with its hand cut off, China's got a new boyfriend, and Nicki returns.